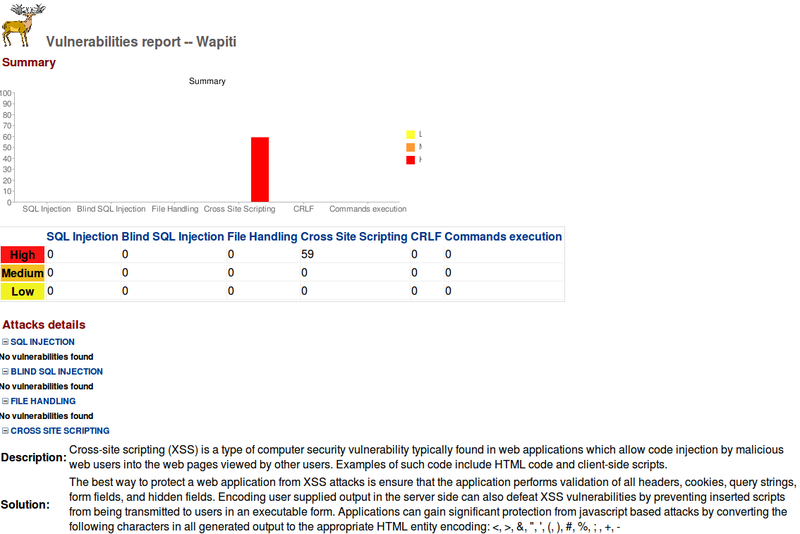 Today, I finally looked at Wapiti, which is a web application vulnerability scanner. It operates on a black box basis (i.e. it doesn’t see the underlying PHP/ASP/Java source code), and effectively tries to ‘break’ any forms on a page. In order to get it to do anything useful, you’ll probably need to provide it with a cookie file to use. Unfortunately, I couldn’t originally get the provided ‘getcookie.py’ file to work, as the application in question just posted the login form details to ” (i.e. <form action=” method=’post’>)…. after a bit of hacking I fixed this, but it took some time. and similar for the other vulnerabilities. I’m a bit annoyed I’ve only found this tool now – but also glad I’ve finally found it. I’ve been looking for something that can pick up XSS holes for ages (SQL Injection stuff I could already test using SQLMap, and ensuring I only ever used prepared statements). 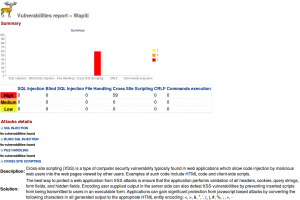 GamaSec identifies application vulnerabilities ( e.g. Cross Site Scripting (XSS), SQL injection, Code Inclusion etc.. ) as well as site exposure risk, ranks threat priority, produces highly graphical, intuitive HTML reports, and indicates site security posture by vulnerabilities and threat exposure. A new version of Wapiti (2.2.0) is available since yesterday. Been looking at wapiti (thanks to your site) for a little while and managed to get it to output results in most cases but sometimed I just get Timeouts on the pages. I looked at using the -n parameter to see if this would help but without success. Is there any chance you could post some examples of using the various parameters that wapiti supports? You need to locate the ‘generated_report’ folder – this will be somewhere within the Wapiti source tree. Copy/move/link it to somewhere Apache can find it. What syntax should be used to scan ONLY for XSS vulnerability, let’s say at abc.com/search= ? Yes – I would expect so. You’d need Python installing which shouldn’t be a problem. After this, instead of all urls from the application, command scans only Login page url, generates report and halts. What options do I need to use so that it will scan all the urls from the application?